One of very few serviced office centres that offers an environmentally friendly and cost effective place of work, in a great location overlooking the Severn Bridge. The centre uses a CO2 free, low energy passive ventilated air handling system also with motion sensitive lights and water reduction devices throughout. 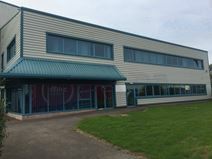 All offices are furnished and benefit from individually controlled central heating, tinted double-glazing, carpeting and floor boxes pre- installed with power and CAT 5e voice and data points, 24-hour access, security, car parking, cleaning, on-site maintenance, communal areas, lifts general signage, health & safety management and full use of reception services. Excellent road links to London, South Wales, the Midlands, and the Southwest, Chepstow train station is located a mile away with local bus routes nearby. These offices with interconnecting doors come fully furnished with excellent broadband connection. There is 24-hour access with 24-hour security. Located just minutes from the M48. this centre is well-connected. Chepstow town centre is less than five-minutes away by car and there are plenty of car parking spaces on site. A kitchen, shared canteen area and cleaning services are provided for tenants.